I have to confess I was a bit nervous. I hadn't read anything by Chernow before, and a part of me thought that maybe Lin-Manuel had created a musical diamond from a coal sort of book. But I didn't need to worry. Even if I wasn't Hamilton obsessed, this is the kind of nonfiction I love. Ron Chernow has done his research. It's really interesting to see the ways that the book and the musical diverge. For example, in the show, Hamilton meets his bffs Laurens, Mulligan, and Lafayette all at once. In real life, those meetings were quite spaced out. Even the best biographers can't uncover everything. There is a fair amount of "Hamilton and Laurens might have been in love" or "Hamilton either lied about his age or we are wrong about his birth year." Either way, I am learning new things on every page and doing that obnoxious thing where I read passages aloud to my husband. This is evident in the musical too, but Chernow really delves into the ways Hamilton was a man made by both circumstance and personality. He happened to meet a lot of people who helped him out, but he kept impressing them by being so stinking smart and determined. Also, a million kudos to Chernow for starting the book with Eliza. It is inspired for AHam and Eliza to have almost equal footing in the musical, but Chernow gets original credit for knowing how awesome she is. Favorite line so far? "He had all the magnetic power of a mysterious foreigner and soon made his first friend: a fashionable tailor with the splendid name of Hercules Mulligan." Why, yes it is. Thank you, Miss Alice, for this most excellent readalong. On to the next chapters! Chernow has just enough (sometimes a little too much, but overall is ok) personality in the book to make it really readable. I'm psyched for the next section 'cause hopefully more Eliiiiiza. I read a bit ahead and thought for a moment that Miranda just randomly named a sister Peggy before I saw that it was a nickname. Long live the Schyuler sisters. Was SO HAPPY this book is not boring and dry. Cos ugh, this would be a slog otherwise. Also looooved that he started the book with Eliza. Well done, Chernow. Right?? I might even read other Chernow books one day that don't have fantastic musicals to accompany them. Been reading passages aloud to my wife here too. I think my husband is lovingly tolerating my Hamilton obsession. Have you turned your wife to the Hamilton side yet? I was also surprised by how "readable" this book is so far! Thanks for sharing details from the musical - I haven't it seen it yet and I CAN'T WAIT! I listen to the soundtrack pretty much every moment my kids are sleeping/not home. Are you planning to see the show? 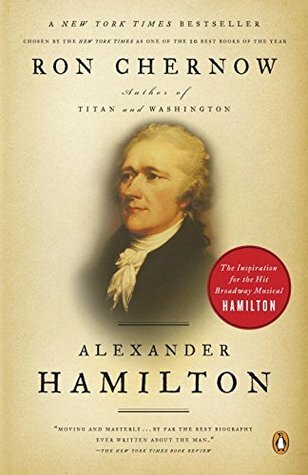 My favorite line so far is something along the lines of "one thing grew crystal clear at Morristown, Hamilton was girl crazy and was brimming with libido." I LOVE IT! Haha. I feel like "Nonstop" was really a song LMM needed to write about Hamilton. He just keeps reading, fighting, and wooing! Ha! I keep reading passages to my husband too. I'm all, "But this massive biography of Hamilton is FUNNY! Believe me! Here's proof! Hercules Mulligan!" "Either way, I am learning new things on every page and doing that obnoxious thing where I read passages aloud to my husband." YES. We are getting smarter and also forcing our husbands to be smarter. I read him the part about Hamilton predicting Washington's battle strategy and he was like, "No way. He must've heard someone else say it." Poor Hamilton. Never free of the doubters.